A Times of Israel columnist blasted the New York Times for what he called an "intentional deception:"
The thing which stands out most – and is most infuriating – about the opinion piece published by Marwan Barghouti in the New York Times is the single sentence below the article identifying the author. “Marwan Barghouti is a Palestinian leader and parliamentarian,” it says dryly. That isn’t an error, that is an intentional deception. Anyone who reads the column without prior knowledge of the facts will come to the conclusion that Barghouti is a freedom fighter imprisoned for his views. Nothing is further from the truth. The missing part of the column is that Marwan Barghouti is a murderer. He was convicted in a civilian (not military) court on five separate counts of murder of innocent civilians. He was involved in dozens of attempted terror attacks. He caused people to lose their families and led to people being maimed. He destroyed lives...The reality is that a convicted terrorist is inventing stories about those who imprison him, as prisoners do all over the world, including in the United States. Instead of saying to him – as a responsible newspaper should – that if he doesn’t have a shred of evidence to support his stories then they can’t be published, the New York Times published them in its opinion pages and didn’t even bother to explain to its readers that the author is a convicted murderer of the worst kind. 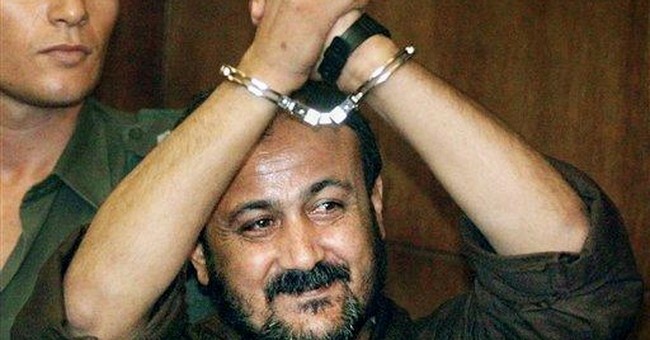 The peak of Barghouti’s violent ‘career’ came during the Second Intifada. It’s worth remembering that it broke out immediately after Israel’s prime minister at the time, Ehud Barak, made the Palestinians an offer that the whole world, including president Clinton, thought was impossible to refuse: a withdrawal to 1967 lines, a division of Jerusalem, a humanitarian solution to the refugee issue. Yasser Arafat said “no” and sent Barghouti and his people to murder Israelis in suicide attacks on buses and in shopping malls. That’s why Barghouti is in prison. Oh. Those specifics cast a slightly different light on Mr. Barghouti's tale of woe, don't they? I'm genuinely curious about the editorial process that led to this piece getting the green light to run. If the Times wanted insights on Palestinian prisoners' hunger strike, shouldn't some effort be made to verify the claims of an alleged victim of Israeli cruelty? And if the person whose byline appears on the column explicitly admits that he's serving multiple life sentences, perhaps a journalistic instincts might lead editors to, you know, look into that? Did New York Times editors know who this terrorist is and what he did, then decide to print his screed anyway -- without making the nature of his conviction crystal clear? Or did they not bother to check? I'm not sure which would be worse. Mr. Walsh is unhappy with a 2016 column in which Stephens rightly described and condemned rampant anti-Semitism in the Arab world. "Not cool," the Times' Cairo Bureau Chief huffed, evidently angered that Stephens had identified and called out a widespread form of deep-seated bigotry as a "disease of the Arab mind." Note that Walsh isn't some left-wing editorialist; he's supposedly an unbiased journalist tasked with directing the newspaper's coverage of affairs in a key foreign capital. Between this revealing complaint and the "Palestinian leader" embarrassment, these consecutive incidents have been duly noted, New York Times.